Whether you want to assist in building a community or whether you enjoy working with your hands, this month we take a look at what it takes to become a builder. 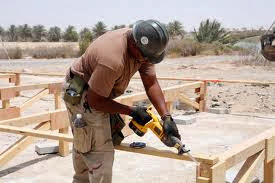 A builder is responsible for several different jobs surrounding buildings and construction and often assumes the position of contractor during a project. Being a builder has several benefits, although it often demands hard physical work. As a builder, you can be self-employed or you can work for a construction or development company. · Understanding how to accurately and safely operate a variety of equipment associated with the building process. … then you could be a perfect candidate to become a builder! Training is a very important part of building, mainly because there are important safety regulations to adhere to during the building process to ensure that buildings are safe for occupation and that they will not be affected by the elements (like wind and rain). If you want to be a builder, it is suggested that you get formal training. It is always an advantage to be able to supply a future employer with certificates and paperwork to prove that you are skilled for the job. There are several colleges that teach building subjects – you can confirm with the Construction Engineering Training Authority (CETA) whether your college or course is certified. If a course is CETA accredited it means that they comply with the minimum industry standards. This is a good course to choose and you know that your training will be of good quality and your certificate valid. You can contact Eduloan as soon as you have decided which school or training college you would like to study at and one of our consultants will be able to give you all the information you require to get the financial assistance you need to realise your dream of becoming a builder. Keep in mind that we also offer loans for all your study equipment – so you do not have to worry about having to buy a level, hardhat or drafting table. For more information or to speak to one of our Eduloan consultants, visit our website www.eduloan.co.za.